On 12 September from 21:00 until 2:00 everyone was invited to to actively participate in the creation of the urban environment with the help of SMSlingshot – a mobile text weapon specially designed for the White Night in Riga by VR URBAN. VR URBAN is an interactive urban art project that was established shortly before the Mediafacades festival in Berlin in 2008. VR URBAN unites three German artists: Christian Zöllner, Patrick Tobias Fischer and Sebastian Piatza. At the Mediafacades festival the artists presented a touch sensitive screen inviting the viewers to write messages and stylized icons that were “shot” onto the facade by a special computerized system. VR URBAN continued to develop the mobile text weapon specially for the White Night in Riga and this time it will be an SMSlingshot. As well as the 2008 installation, the SMSlingshot is a truely tangible interaction device for linking digital data with real urban space. Because of the more and more increasing digitalisation of urban environment the need of an accessibel intervention devices is obvious and necessary. The wish and habit to comment the surrounding world is an ancient still vivant phenomena we try to preserve. The SMSlingshot is an autonom working device, equipped with a high frequency radio, hacked arduino board, laser and batteries. 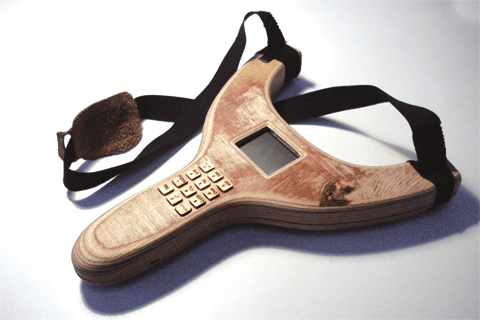 Textmessages can be typed on a phone-sized wooden keypad which is integrated in an also wooden slingshot. After the message is finished, the user can aim on a media facade and “send” the message straight to the targeted point. It will then appear as a coloured splash with the message written within. The text-message will also be real-time twittered as well. All kim? visitors will be invited to actively participate in the creation of the urban environment and not be merely passive observers. Everyone will have an opportunity to intervene both conceptually and visually in the urban sign language while blogging in the city centre with the digital text weapon.